Mug Rugs made with stash yarns in garter stitch on size 10 needles. 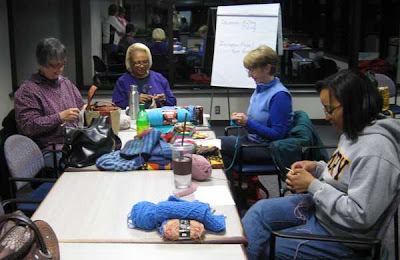 The last session of my Beginning Knitting class was Valentines Day evening. 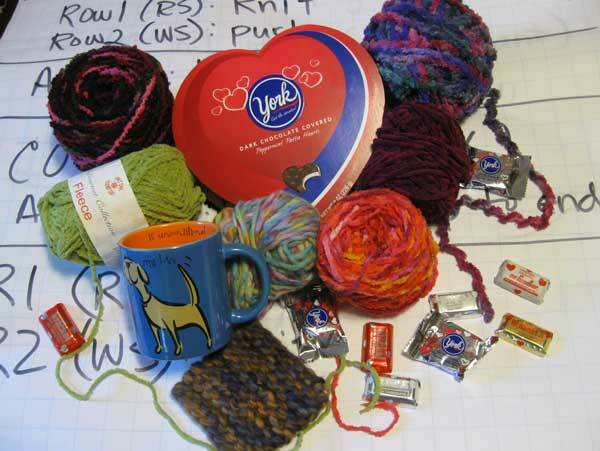 It was an appropriate day to share the Yarn Love—with a little chocolate thrown in. My beginning students are becoming very good knitters and were diligent in practicing between classes. One of the topics I cover in this class is ideas and projects for beginning knitters. A myriad of items can be made from simple squares and rectangles: think about bags, belts, collars, shrugs, ponchos and blankets. For garment inspiration, look to weaving books as weavers naturally work with big rectangles of fabric. With garter, stockinette and reverse stockinette stitches along with knit/purl patterns, the possibilities are also endless. Here is an example of a cute short cardi, "Nimbus" by Berroco, made using only stockinette and garter stitches. Pattern skill level = Easy. 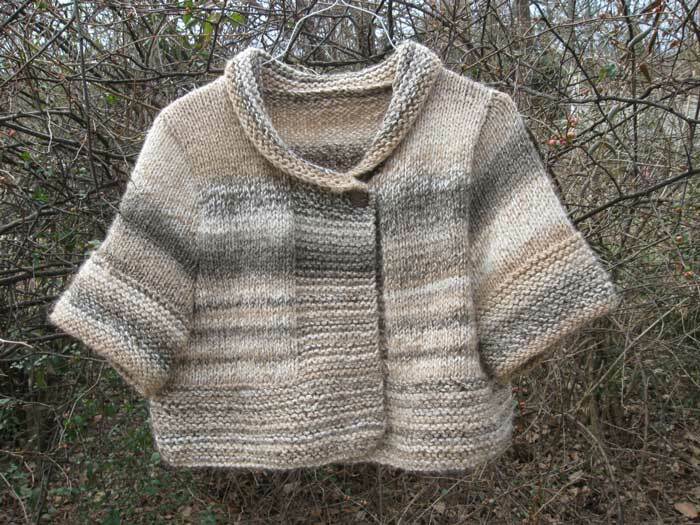 My yarn was self-striping, so I chose to knit the body in the round as opposed to individual back, left and right front pieces as prescribed in the pattern. The pattern has an easy (but very cool) technique for making the fold-over collar. Check it out and get some practice casting on additional stitches to your work-in-progress. Other fun patterns suitable for beginners are Julie Weisenberger's (CocoKnits.com) "Fear of Commitment Cowl" and the "Bohemian Hat and Scarf" set from Universal Yarn. Get your needles humming and Spread the Yarn Love!